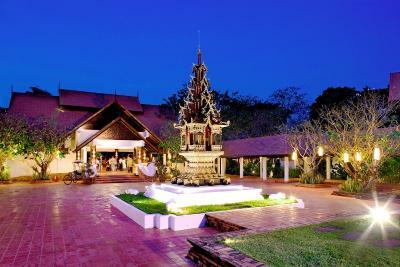 Lock in a great price for The Legend Chiang Rai Boutique River Resort & Spa – rated 8.3 by recent guests! Everything. The staff were fabulous. The room was huge and beautiful. Inside was lovely and outside had a lovely seating area and swinging chair. The shower room was huge. 2 large beds in the standard room. Pool was beautiful and had a lovely view of the river. Was 100baht into town and taxis were very easy to get. Tuktuks from centre back to hotel also 100baht so perfect location. Food and drinks were great. Woukd recommend. STAFF WERE AMAZING. Very nice hotel, pool and good location. The food was not good. We only had breakfast there and it wasn't very appealing, fresh or tasty in my opinion. That is the main reason we didn't try it for dinner, lots of great restaurants out in the centre. The service at the pool was great, although they could do with updating their sunbeds. Excellent location. Enjoyed relaxing by the river. A la carte menu first class Thai food. Very nice and comfortable beds. Huge shower room. Good cleaning. Very nice swimming pool area with a great view over the river. Nice location beside a river. Near town. The property is well maintained with friendly and extremely helpful staff. In general the hotel met our expectations. Nice and clean room with comfy bed and big shower. The property is a little dated but it was no problem for us. Lovely swimming pool with great view of the river. Bed was comfortable and the two balconies were very spacious. Free hand delivered night-time chocolates. Overall the room was great and the staff at the pool were very nice. The Legend Chiang Rai Boutique River Resort & Spa This rating is a reflection of how the property compares to the industry standard when it comes to price, facilities and services available. It's based on a self-evaluation by the property. Use this rating to help choose your stay! Chiang Rai Town is approximately 1 mi from The Legend Chiang Rai Boutique River Resort & Spa, while Chiang Rai Airport is a 20-minute car drive away. When would you like to stay at The Legend Chiang Rai Boutique River Resort & Spa? This room offers upgraded amenities including satellite TV. This large villa features a canopy bed, large riverfront patio and private swimming pool. This spacious room has a furnished terrace and hydro-massage bathtub. This room has a safe, tea/coffee maker, satellite TV and minibar. House Rules The Legend Chiang Rai Boutique River Resort & Spa takes special requests – add in the next step! One child from 3 to 12 years is charged THB 400 per person per night when using existing beds. The Legend Chiang Rai Boutique River Resort &amp; Spa accepts these cards and reserves the right to temporarily hold an amount prior to arrival. The Legend Chiang Rai Boutique River Resort & Spa accepts these cards and reserves the right to temporarily hold an amount prior to arrival. For bookings made from 1 October 2018 onwards, a compulsory Gala Dinner is included in the room rates of 24 and 31 December 2018. The rates of the Gala Dinner are based on room type and occupancy (guests sleeping in extra bed will be charged separately). The walls are thin so if there’s a family next door you hear everything which wasn’t ideal. Our first night much calmer. Breakfast: a lot of choice and tasty food. Guava juice is very nice! Fantastic and relaxing location close to the river. Ideal spot to relax after sightseeing. Mosquitoes net provided, always a plus which ensures a good night sleep. Location is a bit far from city n poor transportation arrangement, only once a day.. 6pm.. Shuttle service provided. And no return to hotel service. Very inconvenient. Breakfast wasn't good. Eggs over cooked and fruit wasn't fresh. Dedicated, very caring staff all the time. Nice room and beautiful river view. The location was far away from everything. No restaurants, no taxis, not very much around. And to far to walk to the city centre. Room is slightly dated but still remain comfortable and spacious.